The 35lb Aluminum Co2 Tank also known as co2 Cylinder does not come with a siphon tube inside. This 35 pound co2 tank is perfect for small productions and is lightweight enough for easy transport. If you want to have a mobile co2 special effect equipment package for your stage effect, this Co2 Tank is perfect for all your mobile co2 special smoke effect needs. The 35lb Tank will last you for about a minute of smoke special effect. The Co2 Tank weighs roughly 72lbs full, this tank is still easy to move when a dolly is not present. This tank does NOT include a siphon tube (also called a Dip Tube or Eductor Tube). For liquid use, such as with CryoFX Co2 Jets, you do not have to turn it upside down. This 35lb tank has a limit of roughly 1:00 minute of liquid Co2 supply and thus will give you about 25 bursts of 4 to 5 seconds each. 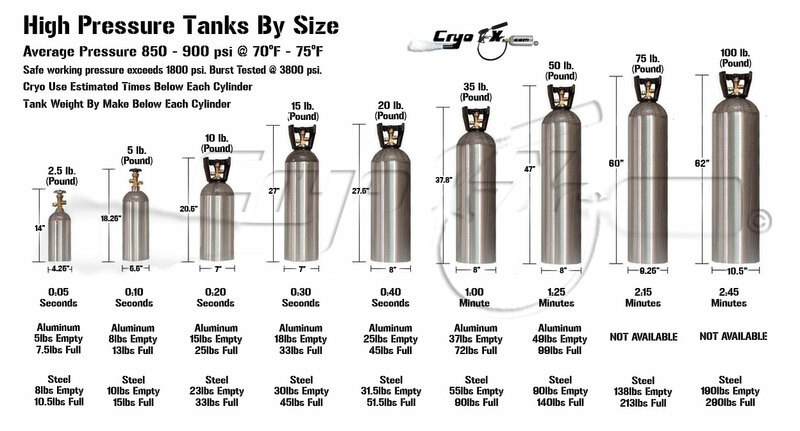 The CryoFX® 35lb Aluminum Co2 Tank also known as co2 Cylinder does not come with a siphon tube inside. This 35 pound co2 tank is perfect for small productions and is lightweight enough for easy transport. If you want to have a mobile co2 special effect equipment package for your stage effect, this Co2 Tank is perfect for all your mobile co2 special smoke effect needs. The 35lb Tank will last you for about a minute of smoke special effect. The Co2 Tank weighs roughly 72lbs full, this tank is still easy to move when a dolly is not present. This tank does NOT include a siphon tube (also called a Dip Tube or Eductor Tube). For liquid use, such as with CryoFX® Co2 Jets, you do not have to turn it upside down. This 35lb tank has a limit of roughly 1:00 minute of liquid Co2 supply and thus will give you about 25 bursts of 4 to 5 seconds each. CryoFX® Premium aluminum 35 lb CO2 cylinder without siphon tube. See store for Siphoned Co2 Tanks. Due to size and weight, this 35 lb CO2 cylinder must ship by itself – separate shipping will appear at checkout.